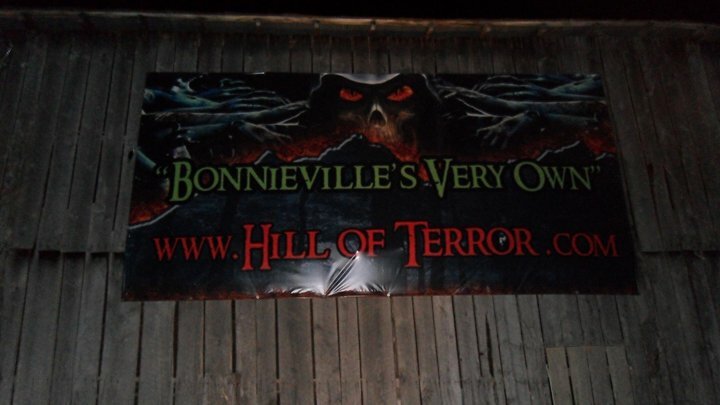 Hill of Terror is a Haunted Attraction located in Bonnieville, KY. 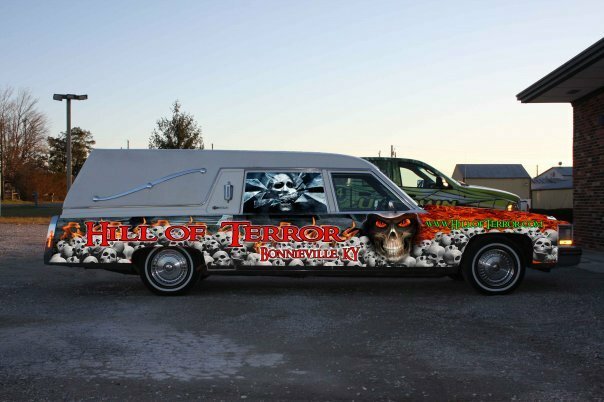 Team Zombillies reviewed this attraction on September 17, 2016. 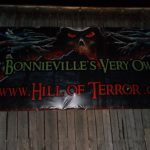 The last time our review group was at Hill of Terror was in 2014 and boy they sure have made a LOT of changes since then! This year, their 100-acre, 37-minute trek has so many twists, turns and trouble that we didn’t know when it was ever going to end! 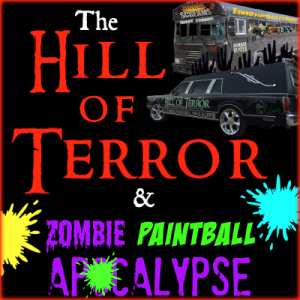 A new paintball group has taken over the ride up the Hill for 2016, so even those who visited them in 2015 will be in for a helluva treat! The piled-up cars, large storage tanks, relentless zombies and interactive targets made this paintball ride one of the best we’ve seen to date! Some of the major changes we noticed on the Hill include a ‘trippy’ rabbit hole, a machine gun turret, a campsite and an additional, full-sized house trailer with a rather interesting family inside. This outdoor haunt has a reputation among our review group for being one of the longest trails that we visit, so bring some good, durable footwear that you can get dirty and run in… you’re gonna need em! Oh yeah, and don’t forget to get your free candy from the Easter Bunny when you see him… he’s got plenty of surprises for everyone!! About 40 volunteer actors and actresses work to fill the crevices on the Hill during any given night. Some of the most memorable ones included the twin “Twisty” clowns, who stalked us with that oh so famous, intimidating stare as we passed through their trailer park. The characters of Wonderland and the shadow creatures in the rabbit hole stood out to us as well, especially since a few of them seemingly came out of nowhere! The Mad Hatter and the Queen of Hearts seemed to be the most authentic for this area due to their fitting dialogue and accents, although we weren’t much in favor of the Queen’s idea of chopping our heads off. Other than that, not much dialogue was used by the rest of the cast in HoT. There were still a few words exchanged here and there, but we didn’t really get the verbal encounters that we typically see, which made for a few less-than-believable performances and, for some of the characters, this left their placement seeming a bit random and without purpose. But don’t let ‘em fool ya… they usually still got their scares in anyway! What we DID get out of them mainly consisted of growls, snarls, screams and, occasionally, a question or small task that still led into an imminent scare. For example, the Easter Bunny was an exceptional trickster himself… we won’t ruin it, but be sure to take the egg if he gives you one (it’s quite a treat, indeed)! You may also come across an actor duo that are searching for their lost dog; we’re sure you’ll find him, but we’ll tell ya… he’s not very friendly. The Insidious demon had, debatably, the most sinister voice at HoT and a couple of his torturous acts were incredibly believable (nice job, victims)! We must, however, note that when we picked off some of the actors coming at us, they discontinued their scare attempts. That being said, we visited HoT very early in the season and we’re sure they’ll get more determined as the year goes on. We also can’t close out the Cast category without mentioning the family in the last trailer on the trail. All we can say is those ‘kids’ had some pretty disturbing imaginations, to say the least! Several of HoT’s characters were in dimly-lit areas and many of those wore dark-colored clothing and coveralls, so several costumes didn’t stick out well enough to make out any details. But that’s not to say there weren’t a few that were obviously well done! The Dark Angel who started our excursion helped set the tone for the trail and the victim in the first room had makeup that matched his fiery demise! The suit and hat on the stilt walker made for a creepy character as well and the authentic-looking masks worn by the twin Twisty clowns and their baggy, distressed outfits left us with little doubt as to who they were supposed to be. There were a few other clowns that we encountered along the trail, but those costumes didn’t look quite as creative in comparison. Other looks that we saw during our walk-through seemed a bit random and didn’t necessarily match their surroundings too. However, The Mad Hatter and the other characters in the Wonderland scene looked like they had some time put into their outfits and the makeup worn by those actresses was particularly noticeable. Speaking of makeup, the demon from Insidious had debatably the most well-done application and his costume was complete with furry demon legs and all! A lot of masks are used at Hill of Terror and, while most of them appeared to be of good quality, a good chunk of them didn’t necessarily match the rest of their outfits, so it left those characters’ looks seeming a bit rushed. 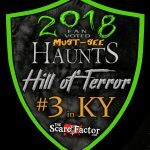 As we closed in on our destination, a couple of “Hill of Terror” signs were found at the last intersection that helped let us know we were on the right track. It was hard to miss the place when we arrived due to the multiple HoT vehicles parked near the road; one was complete with multi-colored flashing lights beneath it. Their large, grassy parking area offers plenty of free parking, but be mindful of where you leave your vehicle if the ground is/will be soft. A popcorn machine was in the first barn if you get hungry and a concession truck was located at the top of the hill that offered snacks and drinks. There were several queue entertainers interacting with the crowd during our visit and one of them (the glittery clown) surprisingly jumped out of the woods and nailed us on our way to the paintball wagon! T-shirts, hoodies, long-sleeved shirts and wristbands were available for purchase at the paintball ticket booth. We came across quite a bit of uneven flooring along our walk, so always be careful of where you’re stepping (one building had a large step down in a dark area with no warning). You will also want to dress appropriately for traversing the outdoors and be careful if it has rained since it may not always be easy to see where the mud is. It had rained prior to our visit and the staff had put down a bunch of straw on the trail to help make it as safe as possible. There were a few places (mainly as we entered the corn fields) where there was some confusion about which direction we were supposed to go, but a we could usually tell which way led to the next scene after a brief look at our surroundings. Very helpful staff members were located in the ticket booth, at the paintball ride, on both the bus and paintball trailer and at the top of the hill in case you are in need of assistance. There were also several portable restrooms located on-grounds in case you still need them after you go through the haunt! 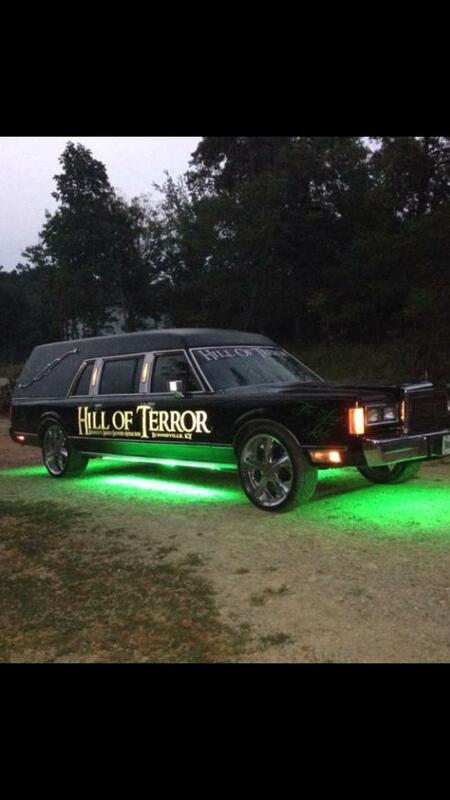 Their “Last Ride” coffin simulator wasn’t in place during our visit, but we were assured that it WILL be shortly and their new, covered waiting area by the barn at the top of the hill should prove to be a welcomed sight if there’s a little bit of rain drizzling during your visit. There were so many special effects at HoT that have been built in-house (as well as purchased) that it made for quite an impressive trail in the SFX department. The cast members who worked with the effects in their areas greatly helped to enhance their effectiveness, but there were a few times when something was delayed or went off a bit too early. Appropriate sounds and hard rock were heard in and near some of the structures, but there were also a lot of areas with little to no sound at all. We’re sure some of this is intentional because it did make a few of the smaller surprises more effective, but it just seemed like there was a little bit too much silence in spots. You’ll learn rather quickly that anything and everything in this place might be out to scare you, which is great for a haunted trail; you can be walking along and BRRRRRRTT… the bridge beneath your feet just vibrated you half to death! Several different effects were used together in short succession with one another, which made them unique and more effective than we’ve seen at other attractions. Intense lighting heightened the energy in some of the scenes and strategically-placed accent lights were also noticed, but other areas were very dark and it was harder for us to see everything that was going on. Some of the effects that we came across at HoT were multiple slides, a crawl space, a shrinking walkway, a see-through floor, jerking bodies, a slanted building, multiple CGI effects, lasers, a machine gun, a rotten bed surprise, a talking zombie, lots of buzzers, a dizzying vortex, a VERY tight and unique claustrophobic passageway, vibrating floors… we could keep going for quite some time! 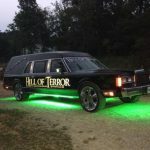 Hill of Terror has such a large variety of scenes and characters that we have chosen not to score them in this category. 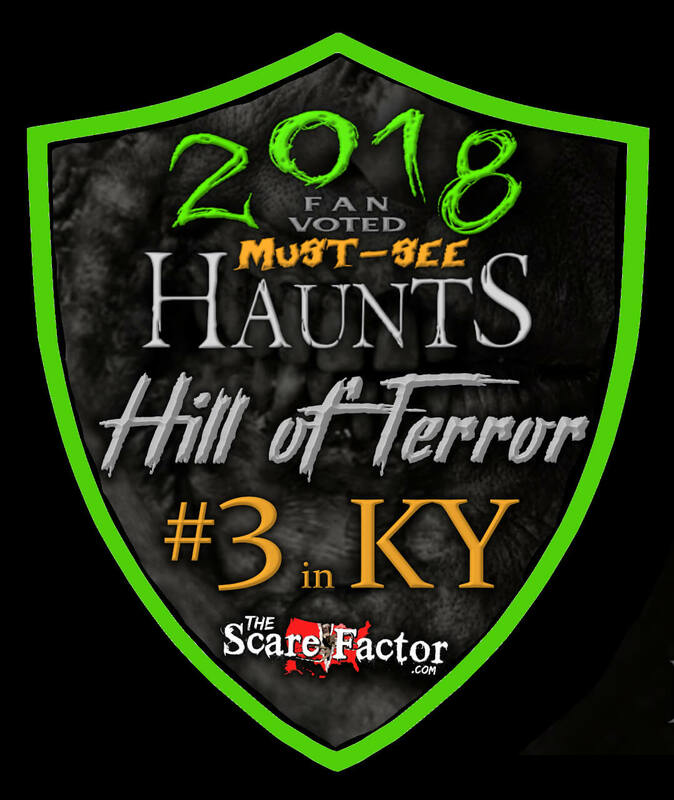 They try their best to make sure they have something to whet every fright-seeker’s appetite, so you will experience many differently-themed areas here. From clowns, crazies and chainsaw-chasing cannibals to their own creative scenes… including the “Panic Attack” room, a machine gun nest, portions of Alice’s Wonderland, a campsite, trailer homes and more, so it’s nearly impossible to always know what’s coming up next! A large variety of fright techniques were used as we traversed the many structures, twists and paths to navigate the trail. Clever hiding spots were utilized, successfully catching us reviewers off-guard on more than one occasion! Several effective distractions were also witnessed and a few of them actually consisted of just props and sounds! The rabbit hole had us thinking “what the…?” and kept us on our toes due to the effects we encountered there… we’ve never seen them used this way before, so you’ll just have to see them for yourselves to grasp the full effect! Although there were only two of us, they did mostly try to come at us from all angles along our way, so we believe they would do this with larger groups as well. Additional types of frights that we encountered include many air cannon blasts, estranged giggles, spraying water, sparks, disorienting areas, loud horns and sirens, intimidating beasts, several chainsaw assaults and even getting “shot” at. Speaking of air cannons, they were so well-placed throughout that most of them made us literally jump several times! One of the last things we saw before exiting the main attraction were some squirming nasties in a toilet, which didn’t really compare to the majority of finales we’ve seen at similar haunts, but make sure you get in nice and close and check that porcelain beauty out for yourselves before you leave the cabin! Went a couple of years ago and loved it. Decided to go back and take some friends. Got there just …show more after 7 and at 10:30 we decided we couldn’t take the cold any longer. So we left and took the loss. We had estimated another hour to hour and a half in line. There were people waiting in line at the bottom of the hill that I know still had 6 hours of waiting. Super disappointed. The actors were great but more friendly than scary.